I wanted to share a few more photos from Willowwood Arboretum here today. Approaching the garden, there is a long driveway that winds through gently rolling hills. 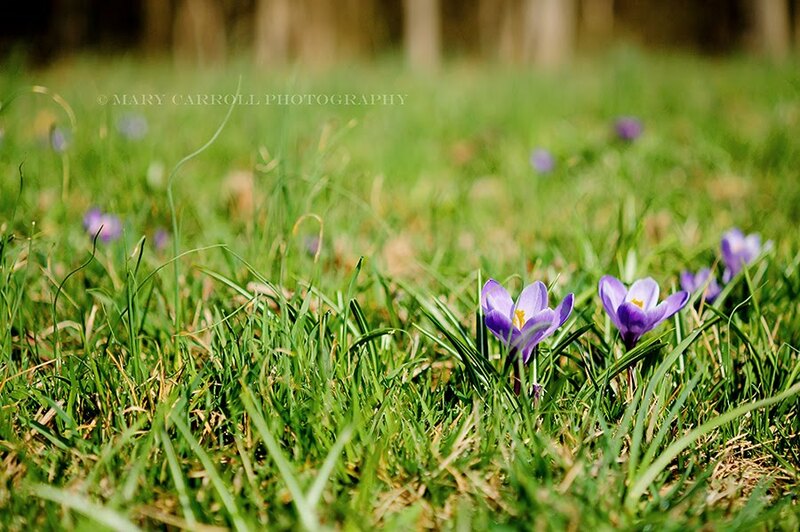 All along the edge of the road, the grass is studded with purple crocus. They are a charming little taste of what is to come. The garden itself is divided into several areas. One of the wilder parts of the garden is made up of a path that meanders through the trees at the back of the house. Later in the spring, there will be a host of colorful primroses lining the path. Here is one of the first ones -- a tiny gem of purple flowers. The little stone bridge pictured above spans a small brook. And look who was enjoying the garden as well -- a lovely bluebird! Just a few notes on the mosaics here: You can find the templates for these mosaics at Florabella Collection. The pretty floral paper used in one of the mosaics is from Sarah Gardner, found here. The Florabella Collection is one of my favorites to use! Beautiful Pictures as always. Happy Spring to you. Gorgeous, gorgeous shots. What an absolutely beautiful place. Thanks so much for sharing (& hosting). Hi Mary, the crocus are beautiful. What a gorgeous place to visit and walk around. Lovely images, I hope you have a great week ahead! Gorgeous little vignettes of Willowsood. Love that stone bridge and the shots around it. 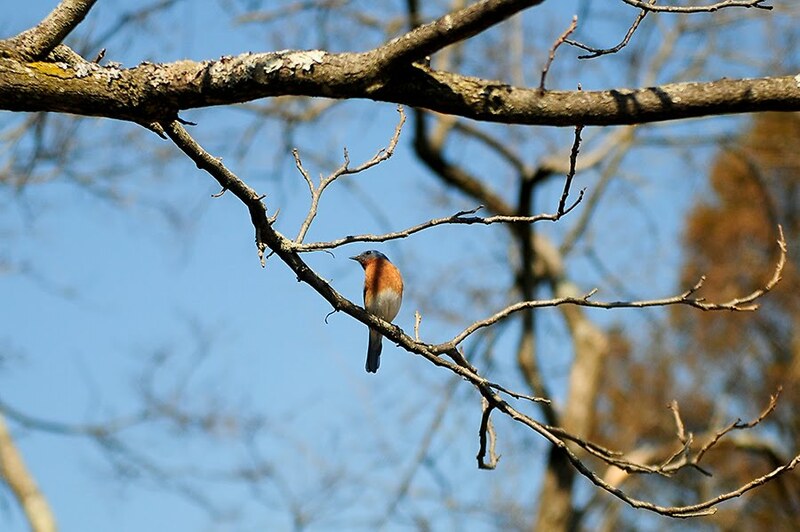 Lovely, lovely, lovely and the last...the bluebird of spring in that beautiful blue sky...exquisite! 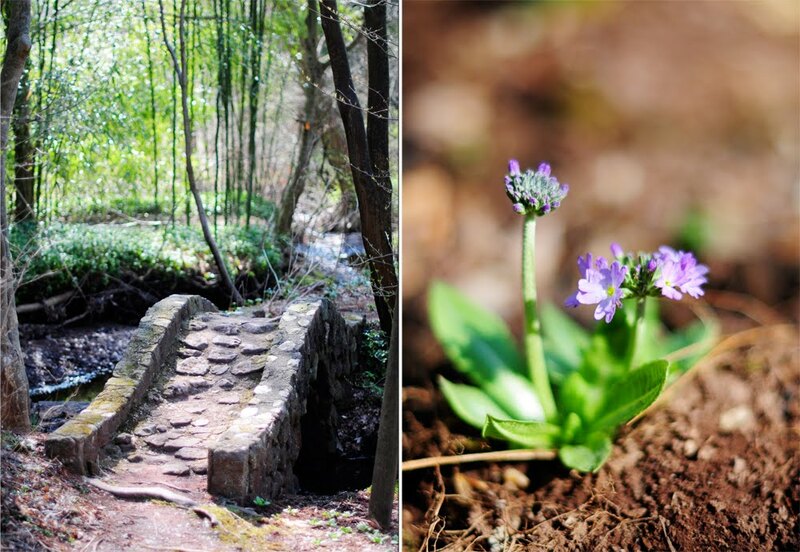 Spring at Willowwood Arboretum is a beautiful place. The little rock bridge takes my breath away. The flowers are glorious! Thanks for taking us along. Beautiful place to view spring, love the stone bridge. 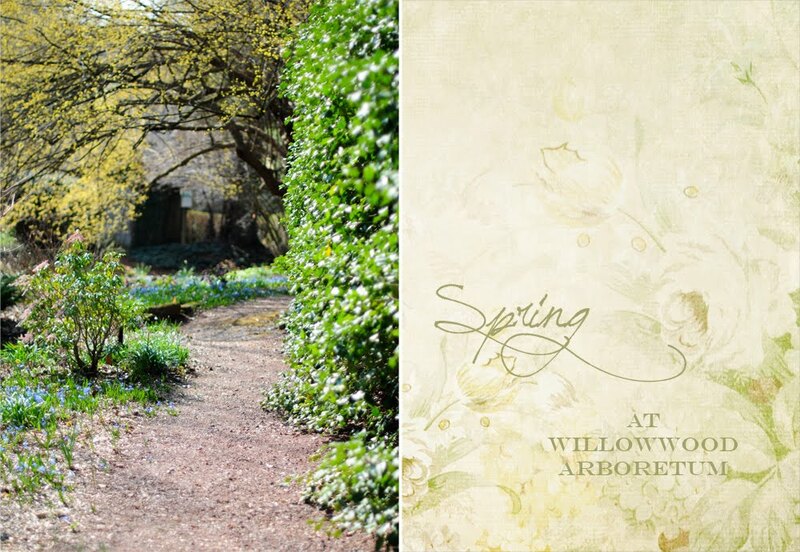 Really enjoy your photos of Spring at Willowwood. 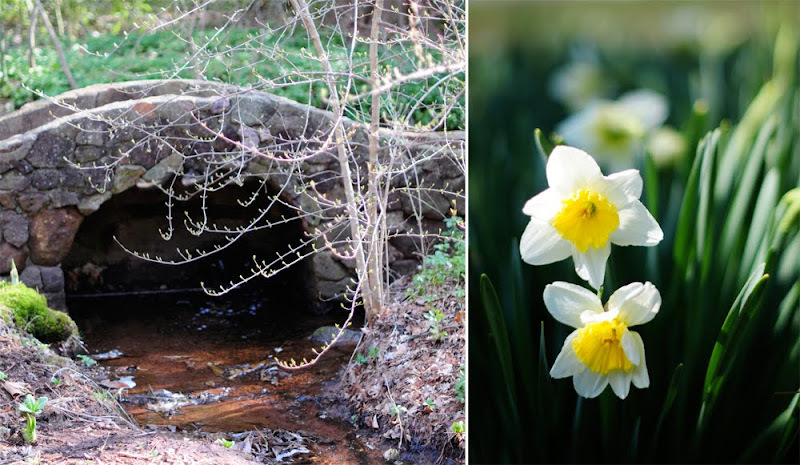 A pretty place to stroll and enjoy the first signs of Spring. Thanks for hosting again this week. Mary - as always, beautiful photos. Love the primrose!! I love when you go to the arboretum!!! Thank you, thank you!!!! Beautiful! Beautiful Mary! I especially love the stone bridge and path! Spring is beautiful in your area -- I'd love to visit that arboretum. (When we travel, we always try to find them, so maybe someday!) Thanks for sharing -- and for hosting. Gorgeous photos as always, mary. I especially love the photo of the bird among the branches--it has such wonderful perspective. Your spring walk has resulted in such beautiful photos....as always. thanks for sharing your discoveries with us once again! Would love to visit here! Beautiful images. I am completely in love with that charming little rock bridge. You have the most beautiful mosaics on the web. Such beautiful spring flowers. I love the image of the little bird. it looks like a really lovely place for a spring walk. I love these gardens with lots of different places and garden rooms. Beautiful mosaic and thanks for the links - I'm off to have a look at them. The floral paper is so beautiful and goes with your mosaic perfectly. Very lovely photos. I am sure you had a marvelous stroll. Beautiful spring flowers and a very wonderful mosaic. Have a fine week and Happy Easter. Your spring photos are just amazing!!! 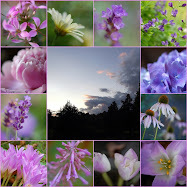 Beautiful, stirring pictures of spring! Ah, the photos are just so amazing! I love the shot where you have to get on the ground to get a good view of those lovely flowers. I think that and the bluebird are my favorites. The old bridge sure looks inviting for a great day of adventure. Beautiful, beautiful place! It's just perfectly beautiful.... Oh, how I wish that I had someplace like this to visit!!! I've been considering, though - there must be SOMEplace around here and I've been determining that I'm going on a hunt for it, this summer. Beautiful Mary! Thank you for hosting! It would be a beautiful place to enjoy a walk! I can see you are future ahead with spring-we are still at the brown stage. Love the photo of the bridge and the culvert. Thanks for hosting. The list is getting bigger each week. Congrats. Lovely pictures! Love them all! Spring captured so beautifully! Only by you, dear Mary!! Beautiful photos Mary. Thank you for hosting. Lovely spring mosaic. That bridge is so charming. Love it. First time linking up to Mosaic Monday. Thank you for hosting. You live in such a beautiful corner of the world! Your photos are just lovely! Spring can easily be appreciated through the pictures of flowers and greenery that you have captured. As a part of the lawn maintenance Phoenix industry, we love to see the beauty and wonders that gardens have to offer. They make the surroundings fresh and worth living in. I would love to take a stroll and ponder my day at the arboretum...I think I would just sit by that stone bridge and watch the blue bird sing... Isn't Spring Wonderful??? I wish I knew HOW to make a mosaic SO I COULD JOIN YOU!!! This is my first time linking to Mosaic Monday. Your spring mosaic is gorgeous. Thanks for hosting and I hope you have a lovely weekend. OMG!OMG! I just realized my post should have a mosaic or collage! Give me a little time to go back and add a collage. I was so excited to add my photos that I guess I sort of crashed your party. Please give me a little time to redeem myself. Thanks so much for hosting this link party. I will be sure to come back and do it right the next time on the first try. how beautiful! And this is a place my family & I could day trip too, which is exciting to know.